Heading into its third weekend, Disney and LucasFilm's Star Wars spin-off Rogue One: A Star Wars Story is already a massive hit, earning $393.5 million domestically and $312.5 million internationally for a worldwide total of over $706 million, from a $200 million budget. While fans keep flocking to theaters over the holidays for repeat viewings, more details are starting to surface about several different aspects of this beloved blockbuster. 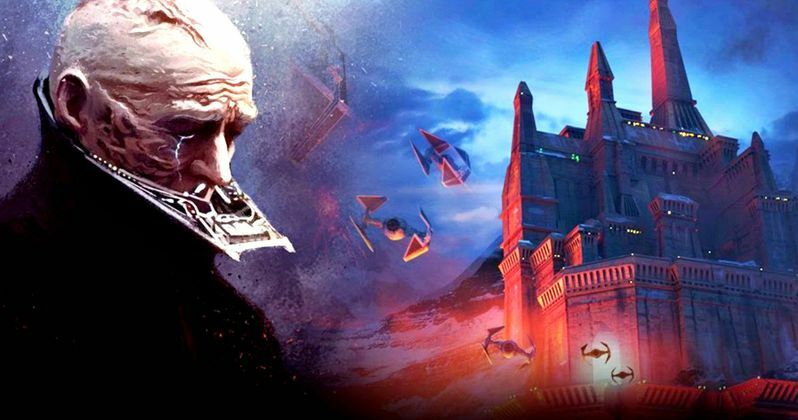 A recent interview with production designer Ted Chiang, who serves as Lucasfilm's VP and executive creative director, reveals new details about Darth Vader's castle on the planet of Mustafar, offering up new Sith secrets. Yesterday, we showed you the epic Darth Vader lightsaber scene from Rogue One recreated with LEGOS and 16-bit video game technology in two new videos, but there was also another important scene with Darth Vader that some found much more intriguing. This scene in question gave fans their first look at Darth Vader's Sith castle on the planet of Mustafar. StarWars.com caught up with Doug Chiang in a lengthy interview, where he shed some light about what went into the design of Darth Vader's home. Here's what he had to say below. "Vader's castle was really fun. When I knew that we were going to possibly go back to Vader's castle, I loved that idea of, "Okay, lets establish Vader's home." The initial idea was, 'Why would Vader live here?' In our minds, we started to come up with a little bit of a backstory. That perhaps this place had special meaning for him, and that this is where he comes to meditate and to heal himself. We started with the idea that maybe it should be built around his bacta tank chamber, and he comes back here to rejuvenate himself and also to meditate. So from there, the structure itself grew out from the bacta tank, and there were certain ideas that we tried. We were trying to go for a very iconic shape, and we always love tall towers. Ralph McQuarrie actually drew quite a few small thumbnail sketches [of Vader's castle] that were very intriguing. They were kind of angular versions of a tower, and I saw the potential of where he was going, and I just exaggerated that quite a bit. One of things we landed on early was this idea of a tuning fork - a twin tower kind of look. And it was really interesting, because then that started to give Gareth a lot of ideas like, 'Well, maybe the structure is built this way because it is like a tuning fork. It's tuning the dark side in terms of the energy.' And then we actually carried that even further to Jedha. The Jedha temple, the tower there, mirrors this but on the good side. So when you see the film, you can start to see, 'Okay, Jedha had its own tower, which was configured like a tuning tower. Vader's tower, Vader's castle, had the same thing but it was made in black, whereas Jedha was white.' You kind of start to see the good and the bad. You may not really notice it on a first take, but hopefully it's that foundation of design subtleties that then the audiences, on second viewing, will appreciate. And I always like to build those elements in there because it makes the design more coherent, it makes the film more coherent, and overall it makes the design language very authentic and real." While Rogue One marks the first time we've seen this actual castle, it's not the first time we've seen the volcanic planet of Mustafar. This planet is where Obi-Wan Kenobi (Ewan McGregor) and Annakin Skywalker (Hayden Christensen) engage in their epic battle, which leads to Annakin's transformation into the Sith Lord Darth Vader. Doug Chiang also discusses the Sith cave located underneath the castle, that many fans may not have noticed during their first viewing. Here's what he had to say about the Sith cave below. "It went back to the original idea of, 'Well, why would Vader be here?" and there was a series of paintings and sketches that Ralph McQuarrie did, where Luke actually visits Vader in this underground lava cave. I always thought that was such a compelling image, because you have this lava lake inside this cave and there was Vader's throne. So we took that idea and thought, 'Okay, well, maybe on the lower levels of Vader's castle, there's a more ancient part. That he actually built this castle on a foundation of an ancient structure.' If you look at the finished design, it has this very strong element of a structure that was there for a purpose, and that purpose was to draw energy from the lava lake. If you look at the design of the base, it feels very much like a dam, and how the lava flows through it, possibly getting energy. And so we thought, 'Okay, well, that's the foundation. Maybe even deeper, or underneath that, is an even more ancient part, which is a natural cave where Vader goes to meditate.' Visually, we're trying to create a sort of history for the tower. The bottom is the most ancient, the lava lake dam part was perhaps what Vader built his foundation on, and then the tower was Vader's addition." As of now, Rogue One: A Star Wars Story is the third-highest film of the year domestically, behind Finding Dory ($486.2 million) and Captain America: Civil War ($408 million). While it will most certainly pass Captain America: Civil War in the next day or two, it remains to be seen if it can unseat Finding Dory as the top domestic movie this year. It still does have quite a lot of work to do if it wants to take the worldwide crown, though, which is currently held by Captain America: Civil War with $1.1 billion.